Dining rooms are one of the high-traffic areas in most homes. Hence, it is vital to choose the right flooring accordingly. So, how do you choose dining room floors? There are different type of dining room floors. Carpets, laminated flooring, and vinyl flooring are some of the most common materials used for floors in the dining area. Carpets are great for adding a touch of luxury and comfort, as well as insulating the sound in the area. Laminated floor, on the other hand, gives your dining room the expensive look and feel of wood for a fraction of the price. Laminated floors are ideal for busy dining areas because they are resistant to stain and easy to clean. For a greater impact to the dining room, use vinyl flooring or luxury vinyl tiles. This kind of flooring provides superb heat and sound insulation as well as elegance and style regardless of your dining room decor. The kind of material you choose depends on the style or ambience you want to create for your dining room. You may choose a flooring that blends with the rest of your dining area or choose one that becomes the focal point of the room. Moreover, the material used must also depend of the kind of family you have. Do you have little children or are your kids all grown up? Carpeted floors may not be ideal for families with small children since there could be a lot of mess, especially in the dining room. Keep in mind that carpeted floors may require a lot of care and maintenance. They can be cozy and classy, but if you think you are going to spend half of your life vacuuming the carpets or rubbing out the stains, then you ought to forget about it. 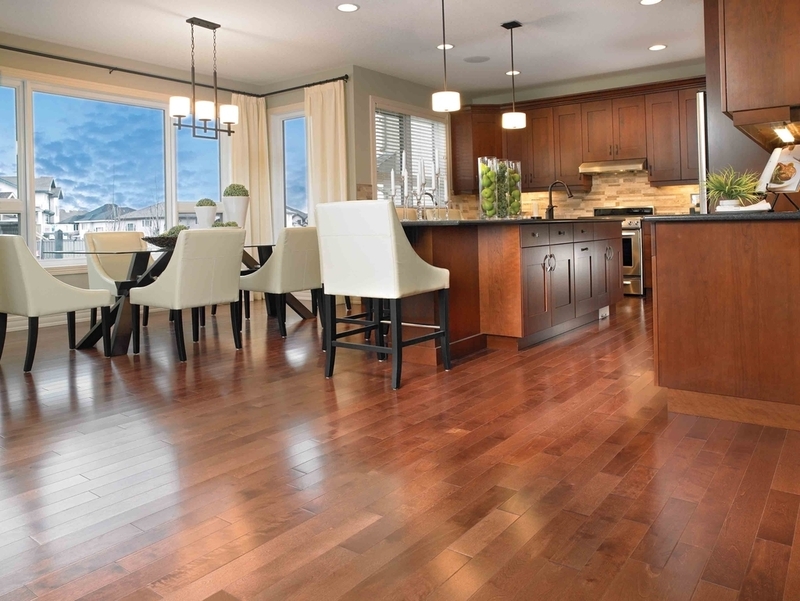 Laminated floor is ideal if you want a warm and modern feel in your dining area. Added bonus in using laminated floors is that you can easily pop out your mop whenever spills happen. Vinyl floors are also low-maintenance materials that look great with any dining room design. Plus, vinyl floors are inexpensive, too. So, have you already decided which flooring material to use in your dining room?